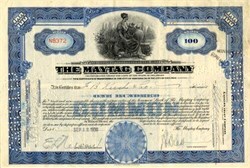 Beautifully engraved certificate from the Maytag Corporation issued no later than 1932. This historic document was printed by the Columbian Banknote Company and has an ornate border around it with a vignette of an allegorical woman looking over a yard, sitting next to a cornacopia. This item is hand signed by the Company's Vice President, R. A. Bradt and Secretary, E. I . Nelson and is over 82 years old. On July 23, 2005 Whirlpool Corp. raised its offer to acquire smaller rival Maytag Corp., increasing pressure on the appliance maker to agree to a buyout. In total, the revised Whirlpool offer is priced at about $1.4 billion. The revised offer represents an increase of 5.9% from Whirlpool's previous offer and is 11.1% higher than the Friday closing price on Maytag's shares. The move, announced late Friday, comes in the wake of Maytag saying its board couldn't render a decision on the $17-a-share offer but would continue to study the proposal. Recently named one of America's Most Admired companies, Maytag Corporation is a $4.7 billion home and commercial appliance company, headquartered in Newton, Iowa. With approximately 18,000 employees worldwide, Maytag is committed to growth through innovation and backed by these well-known premium brand products. In major appliances, Maytag is among the top three companies in the North American market, offering a full line of washers, dryers, dishwashers, refrigerators and ranges under household brand names Maytag�, Hoover�, Jenn-Air�, Amana�, Dixie-Narco� and Jade�. In floor care, Maytag owns the Hoover brand, the market leader in North America and the floor care brand with the highest consumer recognition and buying preference. In commercial products, Maytag owns Dixie-Narco brand, a leader in refrigerated soft drink and specialty vending machines as well as Jade� cooking products. Maytag's presence in markets around the world includes sales operations in Australia, Mexico, Puerto Rico and the United Kingdom. The corporation's export sales and marketing, licensing of brands, and international joint ventures are coordinated by Maytag International in Schaumburg, Illinois. To extend its reputation for innovation, the corporation recently added two new businesses to its portfolio: Maytag Specialty Group and Maytag Services. The Specialty Group expands Maytag's offerings in the luxury kitchen appliance and commercial foodservice equipment markets. The new services business extends Maytag's heritage of quality service into all major appliance brands in selected markets. Additionally, in 2003 the company expanded its product offerings to include small appliances such as high-end blenders, mixers and irons. Maytag is a Fortune 500 company that is headquartered in Newton, Iowa with more than 15 manufacturing plants throughout the United States and Mexico. 1893 Maytag is founded by F.L. Maytag in Newton, Iowa, as a farm implement company. 1907 Maytag introduces its first washing machine. Called the Pastime, the washer is made of water-resistant wood. The Pastime rotates clothes when turned by a handle on the tub lid and is a handy alternative to washboards. 1909 The company manufactures the first power washer. Called the Hired Girl, the machine uses power from tractors and other farm engines. 1915 Maytag builds the Multi-Motor, the first gasoline-powered washer. After the machine�s release, sales and production of Maytag washing machines double. The laundry division outperforms farm implement production for the first time in company history. 1924 One out of every five American washers purchased by consumers is a Maytag. 1939 Maytag produces one of the first white appliances in the industry. The Master Washer has 50 percent more capacity than previous Maytag washers, as well as stain-resistant enamel and an insulated tub that keeps water hot. 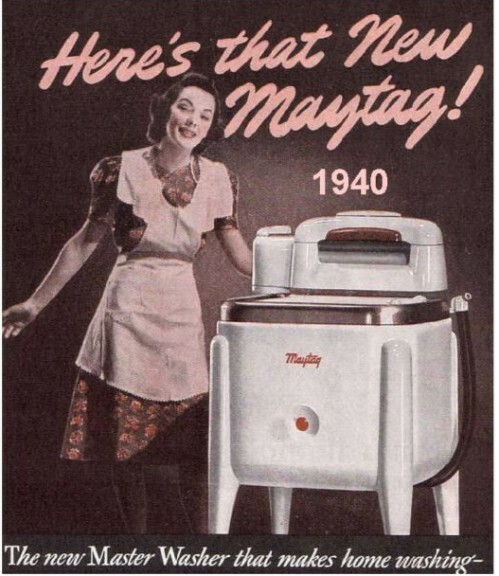 1946 Maytag begins marketing ranges and refrigerators. 1949 The company produces its first automatic washer, called the AMP Washer. The AMP is compact and simple to operate, and engineers continue to upgrade it throughout the 1950s. 1953 Maytag produces its first automatic dryer, called the Maytag �Halo of Heat� Dryer. 1958 Maytag enters the commercial laundry business with coin-operated machines. 1966 Maytag introduces its first portable dishwasher. 1967 The Maytag Lonely Repairman campaign is born. Ol� Lonely� becomes both an advertising legend and an American icon. 1975 Maytag-equipped Home Style Laundries are introduced. 1985 Maytag is the first in the industry to produce the stacked washer and dryer. 1986 Maytag becomes a full-line major appliance manufacturer. 1987 Maytag adds a line of front-loading washers to its commercial products lineup. 1989 Maytag adds a full line of refrigerators to its lines of quality-built appliances. 1997 The company introduces the Maytag� Neptune� washer, a front-loading washing machine that features revolutionary stain removal capabilities, uses 40 percent less water and 65 percent less energy. Maytag also becomes an ENERGY STAR� appliance manufacturing partner, teaming up with the U.S. Department of Energy and the U.S. Environmental Protection Agency. 1999 Maytag introduces the Maytag� Gemini� range offers convenience and efficiency with two separate ovens in a 30-in. free-standing range. Used together or separately, the two ovens allow consumers to cook more than one dish at a time. 2000 The Maytag� Neptune� model 7500 is the world's first washer with touchscreen controls. An on-board stain removal guide called StainBrain� provides solutions for cleaning just about every stain imaginable. 2001 Maytag introduces the Maytag� Wide-By-Side� refrigerator, the widest available refrigerator and freezer space in a traditional side-by-side refrigerator. The refrigerator�s ClimateZone� technology automatically store foods at their optimal temperatures, keeping food fresher longer, and the Elevator� shelf can be moved up or down to accommodate tall or cumbersome items. 2002 A gas version of the Maytag� Gemini� range is produced. 2002 Maytag introduces the world�s first three-rack dishwasher with the introduction of the Maytag� Jetclean� II dishwasher. Its unique FlexLoad� third rack offers industry exclusive performance advantages. 2003 Maytag introduces agitation-free laundry with the Maytag� Neptune� TL, the first top-loading high-efficiency washing machine without an agitator. The machine protects fabrics as it cleans. 2003 In its 50th year of dryer production, Maytag revolutionizes drying clothes with the introduction of the Maytag� Neptune� Drying Center�. The first multipurpose dryer on the market, the Maytag Neptune DC pairs a traditional tumble dryer with a revolutionary upper drying cabinet that minimizes shrinkage, speeds up the drying process, reduces wrinkles, eliminates odors and refreshes clothes - saving time and money.